An old milestone, positioned 1 mile from Lower Deal and 73 miles from London, stands at the corner of this Classical Georgian House. Until the introduction of the Turnpike Trusts in the 18th Century, no milestones had been erected since Roman times. Consequently, we can be reasonably sure that this stone appeared when what is now London Road was constructed in around 1818. This particular section of the Turnpike between Dover and Sandwich provided what might be described these days as the “Middle Deal Bypass”. It is interesting to note that Upper and Lower Deal were originally joined by the two closely parallel routes, known today as Church Path and Middle Deal Road. The former probably served as the corpse road or bier-path that had to be the width of two men and a coffin: the path, having crossed Manor Road, enters St. Leonard’s churchyard through the simple “lichgate”. Milestone House, when built, would have had an uninterrupted view, in a south-easterly direction, across the open countryside to the sea. The rear garden backs directly on to Church Path and a bricked-up entrance is still visible. All the older properties built between Church Path and Middle Deal Road point in the same direction, Middle Deal Road providing entry to the rear - the “service road“. Until recently, Milestone House has been used by a number of interesting residents. In 1843, it was occupied by a Richard Roffey, who was probably the gentleman who owned land and property in Ringwould, Oxney, Westcliffe, East Langdon and elsewhere. Dr. Thomas Denne Hilton, born at Wingham and educated at Cambridge University, lived in the house in the latter part of the 19th Century. Having practised for a time in Guernsey, he retired to Deal “devoting himself to scientific pursuits”. In 1914, this seven-bed roomed house was still owned by the Hilton Family. 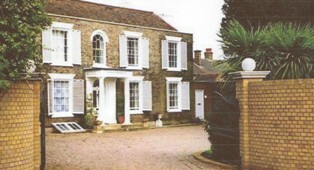 Between the two World Wars, the house was used by a number of army and naval officers. These included Col. J. H. Juxon-Jones, who was promoted from the rank of major in 1900 when serving with the Indian Staff Corps. Milestone House is a Grade 2 Listed Building and the main range has probably undergone little change since it was first erected. A decade ago, it was converted into a Residential Home and it now graces the Upper Deal scene.